Next Improvements, the Front Suspension. The project is a success. The car rides more firmly without bottoming-out on acceleration and the cornering overwhelmingly improved. The total project cost - machine shop, powder coating, parts - around $1000.00. The next project is the front suspension. It will be inspected structurally and upgraded with the latest parts and technology. Canley Classic's tubular upper a-arms will replace the existing modified ones; they allow full adjustment of the camber. At this time the lack of adjustment is affecting my "perfect" steering response. 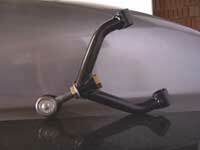 The lower control arm will be reworked and powder coated. 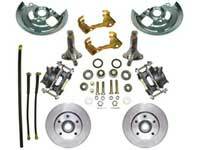 A 1968 Chevy Nova disc brake conversion kit will be installed (the Spitfire is currently running Chevy A-body spindles - employed in the Nova design) - this is a "bolt-on" improvement. 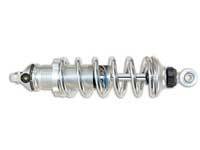 And, new shocks - AFCO double adjustable, coil-over springs will be installed. I am going to try the 350 in-lb rate - presently they are 400 in-lb. I will take plenty of photos.